As a follow up from my last post on drinking coffee in Mauritius. you’ll be pleased or jealous to know that our way back to Europe, it was just too tempting not to stop over in my favourites foodie city of the moment, Cape Town, to delight my palate (OK ! another word for taste buds…), so I gave into temptation and we stopped over in Cape Town for a very short while. On the day I dedicated to the family, we stopped over in a massive mall, about 20 minutes drive from downtown Cape Town, Century City. Of course, after the usual late lunch, I was not scanning the place for a decent cup of coffee and after pacing up and down past numerous places offering coffee, I decided to try my luck at Woolworths, which has no resemblance to the UK Store that went bust last year or the US version of a bargain hunters paradise. No ! Woolworths in South Africa is almost a spitting image of Marks & Spencers in the UK or the equivalent of decent high quality clothes store, which offers food of really high quality. So in summary, they should not compromise on anything food related and they haven’t to an extent. 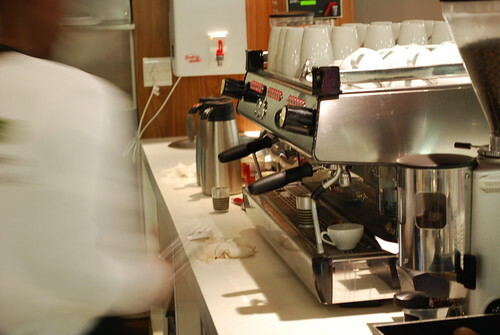 I actually first visited Woolworths Cafe in the summer of 2006, when I spotted a La Marzocco FB70 machine in the store in another city, Durban, but the coffee wasn’t that great. However, since then, Woolworths have put more effort into their coffee venture, by first sourcing organic and fair-trade coffees from within the Africa continent and secondly by paying closer attention to the training of their baristi (plural for barista – some Italian lessons), so much so that in 2009, one of their baristi won the South African Barista National Championships – not bad, plus of course they seem to only use La Marzocco espresso machines, hmmm ! So on approaching the Woolworths Cafe next to the food section inside the store, noticing a La Marzocco GB5, I went up to the barista and after introducing myself, asked him if he knew how to use a GB5, he looked at me amusingly like “what kind of coffee machine nerd is this” and said “Yes !”, so I told him, I was a bit of a coffee expert (well aspiring to be one between me and you) and I ordered a double espresso, sat down and watched. Not bad – the crema was present, the coffee a bit bitter and slightly hot, but not bad for an outfit that doesn’t offer coffee as its primary product. 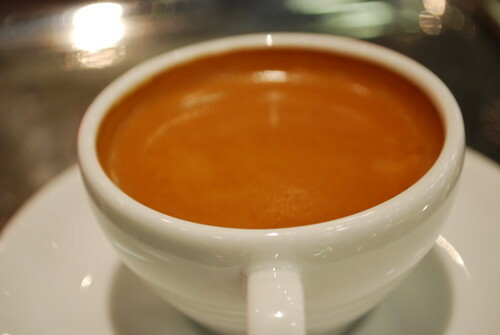 I’m also going to go out and say that this is the best espresso I’ve tasted in a mall, for what it’s worth. 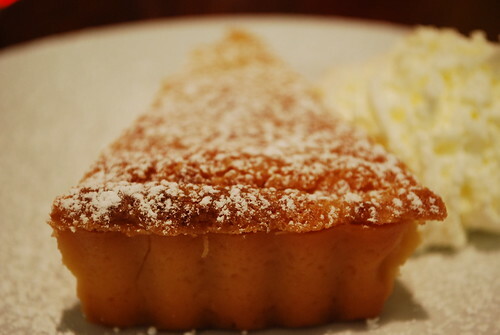 In any case, being a place that strives to offer high quality food, I was tempted to try a piece of cake, and went for a Pear and Almond Tart, delicious and worth every crumb. So in summary, if you’re shopping in a mall in South Africa that has a Woolworths Cafe in it, or there is one near by and you need that coffee fix and don’t know where to get it, try an espresso, a filter coffee or a cappuccino @ Woolworths Cafe. This entry was posted on Wednesday, August 12th, 2009 at 10:23 pm	and tagged with Cape Town, GB5, La Marzocco, pear and almond tart, Woolworths Cafe and posted in Bean There - Cafes, Coffee News. You can follow any responses to this entry through the RSS 2.0 feed. Desiree – I don’t have a cafe in Cape Town yet but hope to God willing next year. Did you mean at Woolies, as they say in SA ? what coffee beans d woolies use?